All donors should consult with their tax advisors to review their individual circumstances. The Iowa Insurance Hall of Fame Scholarship Endowment Fund at the Community Foundation of Greater Des Moines is an Endow Iowa qualifying Agency Endowment Fund. The fund maintains assets that benefit the Iowa Insurance Hall of Fame Scholarship Endowment Fund and distributes investments on an annual basis, creating a stable income stream. 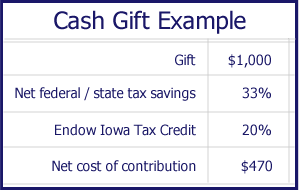 Contributions to the Iowa Insurance Hall of Fame Scholarship Endowment Fund are eligible for a 20% Endow Iowa tax credit in addition to normal state and federal income tax deductions for certain charitable gifts. * This endowment fund is administered through the Community Foundation of Greater Des Moines. The Community Foundation of Greater Des Moines is a donor-driven public foundation whose purpose is to improve the quality of life in Greater Des Moines through philanthropy. The Community Foundation of Greater Des Moines administers more than 590 charitable funds created by Iowans and distributed nearly $28 million in grants in 2008. The Community Foundation of Greater Des Moines is Confirmed in Compliance with National Standards for U.S. Community Foundations. *All donors should consult with their tax advisors to review their individual circumstances. ** Note on the memo line this gift is for the Iowa Insurance Hall of Fame Scholarship Endowment Fund.